This report describes the latest iteration in a long-running espionage campaign against the Tibetan community. We detail how the attackers continuously adapt their campaigns to their targets, shifting tactics from document-based malware to conventional phishing that draws on “inside” knowledge of community activities. This adaptation appears to track changes in security behaviors within the Tibetan community, which has been promoting a move from sharing attachments via e-mail to using cloud-based file sharing alternatives such as Google Drive. We connect the attack group’s infrastructure and techniques to a group previously identified by Palo Alto Networks, which they named Scarlet Mimic. We provide further context on Scarlet Mimic’s targeting and tactics, and the intended victims of their attack campaigns. In addition, while Scarlet Mimic may be conducting malware attacks using other infrastructure, we analyze how the attackers re-purposed a cluster of their malware Command and Control (C2) infrastructure to mount the recent phishing campaign. This move is only the latest development in the ongoing cat and mouse game between attack groups like Scarlet Mimic and the Tibetan community. The speed and ease with which attackers continue to adapt highlights the challenges faced by Tibetans who are trying to remain safe online. The Tibetan community has been the target of malware-enabled espionage campaigns for over a decade. The attackers responsible for these campaigns are relentless in their attempts to compromise networks and harvest sensitive information. These attacks often demonstrate high levels of sophistication in the social engineering used to entice targets to open malicious attachments or links, but are typically not very technically advanced. A common technique is the use of document-based malware. In a recent four-year study on targeted malware attacks against civil society, which included six Tibetan groups, we found that document-based malware was the most common attack vector, accounting in some cases for up to 95 percent of all attacks against specific Tibetan groups. The Tibetan community has recognized these patterns and made efforts to change user behaviors to mitigate the attacks. For example, groups have started a digital security training campaign called “Detach from Attachments”, which urges users to avoid sending or opening email attachments, and to use cloud-based storage (e.g., Google Drive) to send files instead. However, as the community changes behaviors, so do the attackers. Recently, Palo Alto Networks reported on a years-long espionage campaign they call “Scarlet Mimic” that targeted Tibetan and Uyghur groups (as well as government agencies in Russia and India). The Scarlet Mimic campaigns are a typical example of the attacks civil society faces. Carefully crafted email lures are sent to targets carrying exploits that leverage well-known vulnerabilities (e.g., CVE-2012-0158&lt, CVE-2010-3333), which we have seen used in campaigns against Tibetan groups frequently in recent years. In this post, we show that servers used as malware C2 infrastructure by Scarlet Mimic are now hosting phishing pages designed to steal Google credentials from Tibetan activists and journalists. This shift in tactics from malware to phishing campaigns suggests that the attackers are adapting to behavioral changes in the Tibetan community. In the following sections, we provide an overview of malware campaigns connected to Scarlet Mimic we observed targeting Tibetan groups from 2013-2014, and analyze how the same infrastructure is now being used to host a wave of phishing attacks. We conclude with discussion of what may have motivated this change in tactics, and provide recommendations for targeted users. According to Palo Alto Networks, Scarlet Mimic has been active for at least four years. The attack group primarily uses well-known vulnerabilities and the “FakeM” malware family first reported by Trend Micro in 2013, which attempts to disguise its malicious traffic as commonly used protocols. A cluster of Scarlet Mimic attacks used the FakeM Custom SSL variant and were deployed on C2 infrastructure that relied on free domains provided by Securepoint, a German dynamic DNS service. Dynamic DNS services typically allow anyone to make free subdomains from a main domain. In the case of Securepoint, this service allows anyone to make free subdomains from *.firewall-gateway.com, *.my-gateway.org, *.myfirewall.org and others. We speculate that the attackers may have selected this particular service, because the domains have innocuous technical names (e.g, *.firewall-gateway.com) that may escape casual scrutiny. These kinds of domains can change ownership over time and may be shared by many unrelated users, which can also make analysis more challenging. Our analysis of attacks against the Tibetan community reveals a series of campaigns active from 2013 to 2014 using the FakeM Custom SSL variant and dynamic DNS infrastructure that is linked to Scarlet Mimic. 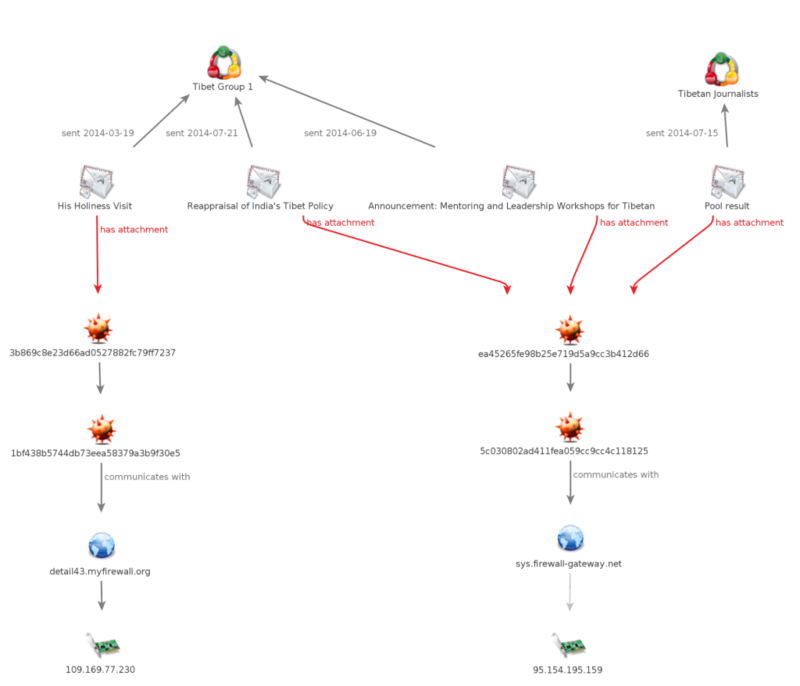 These malware samples are described in detail in the Palo Alto Networks Scarlet Mimic report. Through our engagement with the targeted groups, we provide further context that demonstrates the level of social engineering and targeting put into the attacks. Understanding this context provides insights into the attackers’ tactics, including their later pivot to phishing campaigns. Dear Steering Committee Members, Thanks everyone for all of the good suggestions! Here is the Updated Strategic Plan and we’re looking forward to more comments please! We observed the attackers again on March 19, 2014 when they targeted a different Tibetan group. The attack masqueraded as a message from a representative of the Office of His Holiness the Dalai Lama (HHDL) in Taiwan and contained an attachment that referenced an upcoming visit of HHDL to Japan. Similar to the previous attack, the attachment dropped the FakeM Custom SSL variant, and is also referenced in the Palo Alto Networks report. In this case the malware connected to the C2 detail43[.]myfirewall[. ]org, which at the time of the attack also resolved to the same IP address as the previous campaign, 109[.]169[.]77[.]230. Another set of attacks spanned from June to July 2014 targeting the same Tibetan group and a number of Tibetan journalists. The Tibetan group received multiple e-mails purportedly from NGOs working on Tibetan issues, while the journalists were enticed by a promise of survey results on Tibetan political attitudes. All of these attacks used the same FakeM Custom SSL variant and connected to the C2 sys[.]firewall-gateway[. ]net, which resolved to 95[.]154[.]195[. ]159 at the time of the attack and was also hosted on UK server provider iomart. See Figure 1 for an overview of the campaign. Figure 1: Overview of Campaign 2, showing how the same malicious files are spread using different pretexts. Throughout November 2015 we observed Scarlet Mimic’s C2 infrastructure being repurposed to host phishing attacks against the Tibetan community. The phishing campaign we identified consisted of targeted emails with email senders and messages that are relevant to the Tibetan community. The emails appeared to share links to documents or videos on Google Drive or video sharing websites. Using the example of an e-mail sent to Tibetan journalists, we can demonstrate how a typical phishing attack in the campaign works. The e-mail masquerades as sent by a Tibetan activist, describes a video on China and Tibet, and shares a link to what appears to be a video sharing site. 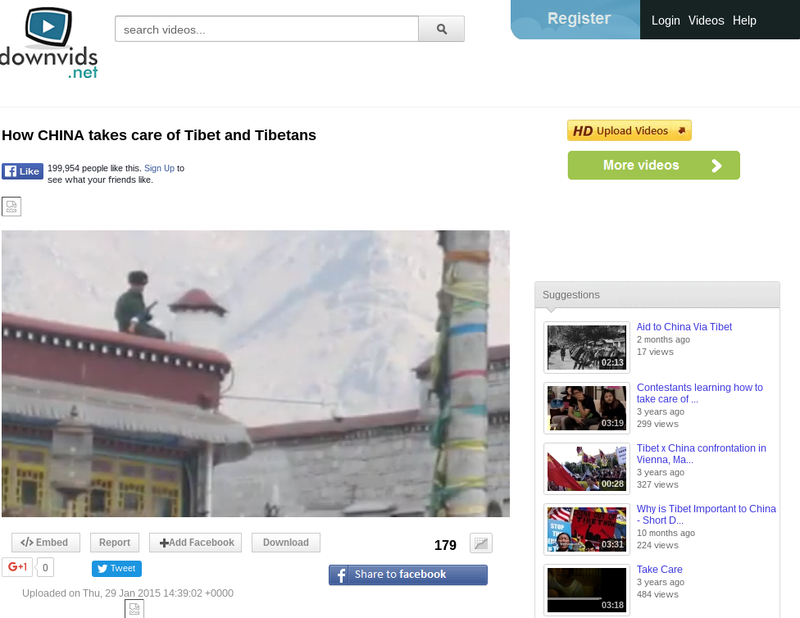 This video – How CHINA takes care of Tibet and Tibetans – is short and easy to understand. Must watch. The site displays a lookalike to the Google Gmail login page (see Figure 2). 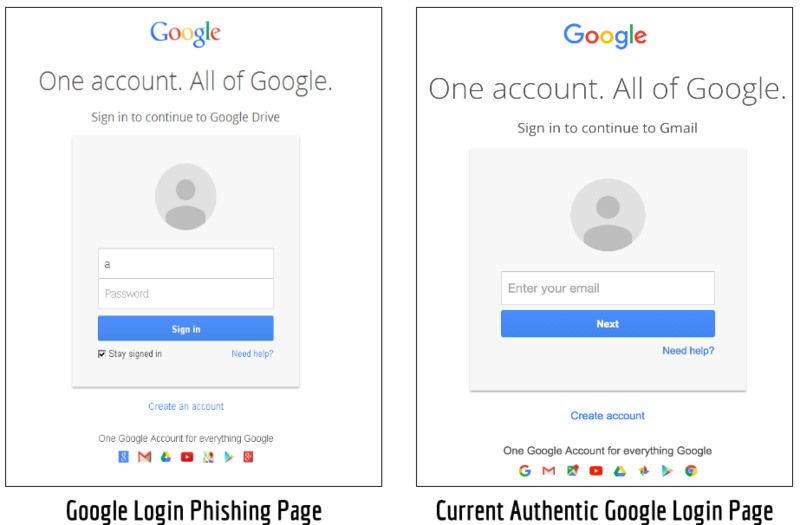 Figure 2: Comparison of Google login phishing page (left) and authentic Google login as of March 2016 (right). If a victim enters their credentials, the data is sent to the attackers via an HTTP POST request that is formatted as: http://accountgoogle.firewall-gateway.com/serviclogin/ojkiojr09[.]asp. An example of the data that is sent back to attackers is provided in Figure 3. Figure 3: A sample of the data sent to the attackers. The Email and Password fields are the most relevant. Once a user enters their credentials they are redirected to decoy content. In the example attack against Tibetan journalists, if the victim entered their credentials they were re-directed to the video “How CHINA takes care of Tibet and Tibetans” on the video sharing site referenced in the email (see Figure 4). Figure 4: Screenshot of destination content. We have observed the campaign active between at least November 9, 2015 to December 18, 2015. During this period we collected three phishing emails sent to Tibetan journalists and NGOs. Monitoring the URLs that link to the phishing page reveals that the destination content to which the user would be forwarded was changed frequently. These changes suggest that the campaign was active beyond the three emails we collected and the attackers were sending out additional emails with messages linked to the new destination content. Figure 5 provides a timeline for the campaign and shows when emails were received, the original destination content provided, and changes to the destination content over time. On December 18 the servers were up, but no content was being served in reply to logins. 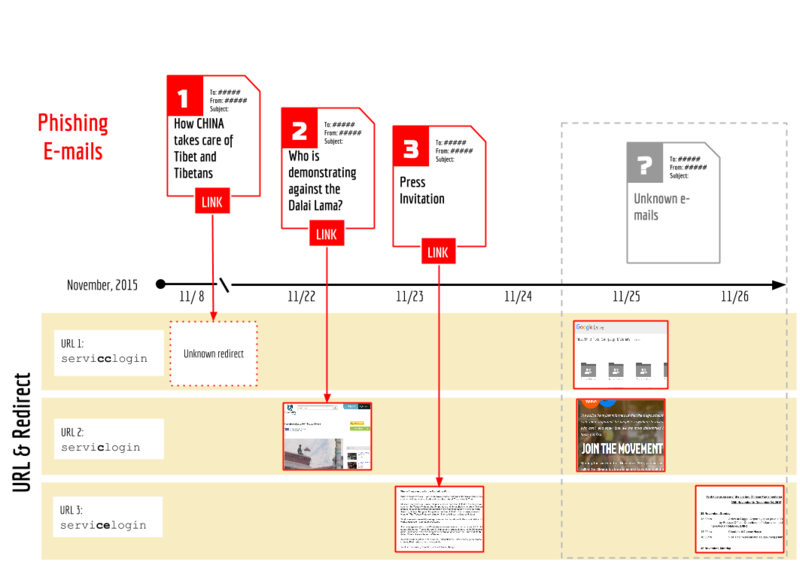 Figure 5: Timeline of phishing campaign (see Appendix A for full details). While we only collected three emails during the span of the campaign, changes in the destination content suggest the timing and theme of further phishing attacks. On November 25, 2015 the destination content on URLs 1 and 2 were both changed to climate change-related content. The content redirected from URL 1 was changed to a public Google Drive folder that contained campaign materials on climate change from a Tibetan NGO. The content redirected from URL 2 was changed to a website used to organize the Global Climate March (globalclimatemarch.org), a demonstration to raise climate change awareness. The climate change theme is significant. During this period Tibetan organizations were taking part in advocacy to raise awareness on climate change in Tibetan areas in anticipation of the United Nations Conference on Climate Change held in Paris, France from November 30 to December 12, 2015. See Appendix A for details on each attack and destination content change. Similar to the previous malware campaigns, all three of these domains are also hosted on iomart. We observed the first phishing campaign using this infrastructure in early November 2015. During this time, two of the domains (filegoogle[.]firewall-gateway[. 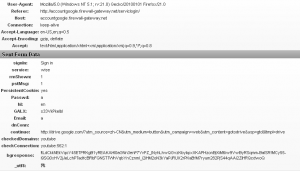 ]com, accountgoogle[.]firewall-gateway[. ]com) resolved to the IP address 95[.]154[.]195[.]171. Table 1 shows connections between domains identified by Palo Alto Networks, domains we see used as C2 servers in the previous malware campaigns, and relations to servers hosting the recent phishing campaigns. The overlap in domains and passive DNS records shows the infrastructure relationships between the previous Scarlet Mimic campaigns and recent phishing campaigns. Table 1: Comparison of domains and hosting seen by Citizen Lab (labelled “Citizen Lab Seen”) and the FakeM Custom SSL cluster described in the Scarlet Mimic report (labelled “FakeM Custom”). For all the matched servers we sent a query to the URL path (/servicelogin/ojkiojr09.asp), which is used to redirect victims to destination content in the phish attacks. The purpose of this query was to to determine if any other servers would forward us to content in the same manner we had observed in the attacks. We found one other IP address (87[.]117[.]229[. ]109) on iomart that responded to this query. We observed this server responding with a redirect to an article by Radio Free Asia regarding the arrest of the aunt of Tenzin Delek Rinpoche, a Tibetan monk who recently died while in a Chinese prison. We saw this content active from November 30, 2015 to December 3, 2015, when the forward link stopped working, which may mean that the campaign completed at this time. 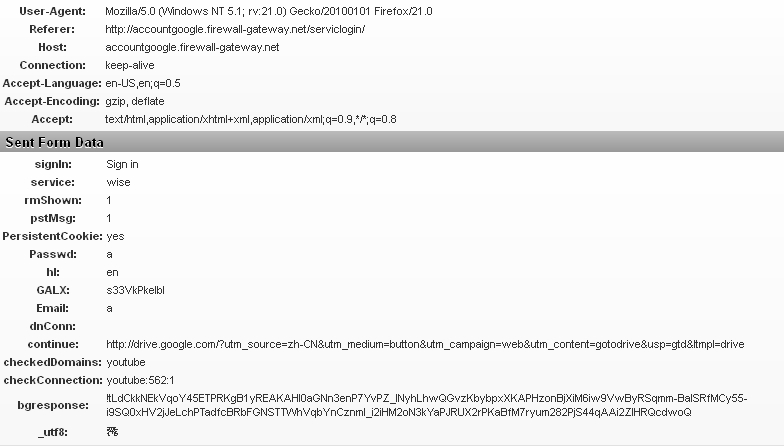 The domain: firewallupdate[.]firewall-gateway[. ]net was referenced in the Palo Alto Network report and pointed to both the IPs we identified at different times (see Figure 6). Figure 6: Domain overlap between two iomart IPs in the phishing infrastructure. Additionally this new IP had two additional domains that were also using the Securepoint dynamic DNS service: updata[.]firewall-gateway[. ]com and accounts-google[.]firewall-gateway[.]com. We saw one of the domains: detail43[.]myfirewall[. ]org used as a C2 server for an attack in the previously described Scarlet Mimic campaign from 2014. Why the Shift to Phishing? When Scarlet Mimic shifted tactics, they failed to properly compartmentalize their phishing and malware operations, relying on known C2 infrastructure for the new phishing campaigns. Although they tried different attack vectors they still fell back on old habits and resources that could be leveraged by analysts. Monitoring the infrastructure enabled us to track the campaigns over time and demonstrates the importance of infrastructure analysis for security researchers. The shift to phishing campaigns is significant, as Palo Alto Networks only observed document-based malware attacks. Importantly, Scarlet Mimic may be continuing to conduct as-yet unreported malware campaigns on other infrastructure. There are a number of potential explanations for this change. The phishing campaigns targeted multiple organizations and individuals in the Tibetan community. Many of these groups act as distributed networks, with staff members and collaborators around the world. The attackers are, therefore, not necessarily targeting compromise of office networks, but rather social networks. Credential phishing is a potentially more efficient means of gaining access to these networks than document-based malware. In addition, the promotion of behavioral changes in the Tibetan community and the use of document-sharing platforms such as Google Docs over email attachments may have put pressure on attackers’ tactics and led them to experiment with simpler, but potentially effective vectors, such as phishing. In other attacks against the Tibetan community over the past year we have also seen malware sent via Google Drive links in targeted emails. The Scarlet Mimic phishing campaigns add further evidence that attackers are attempting to leverage the wide use and trust of Google applications in the Tibetan community. It is also possible that the rising detections by antivirus products of Scarlet Mimic’s preferred malware toolkit play a role. Out of the 74 FakeM sample hashes provided in the Palo Alto Networks Scarlet Mimic report, 61 are available on VirusTotal. When the samples were first submitted to VirusTotal some had zero detections and an overall average detection rate of 38 percent. Following the publication of the Palo Alto Networks report the average detection increased to 54 percent. The current average detection rate is 71 percent, the highest is 80 percent (46 / 57 antivirus scanners), and the lowest is 51 percent (23 / 45 antivirus scanners). These current detection rates may make the malware that the attackers used in past attacks less reliable for successful infection. While the attackers could be pivoting to new, less detectable malware, simple phishing attacks may also involve less effort and achieve higher success against journalists and NGO targets. Finally, we cannot rule out that converting burned or low-utility command and control servers to phishing might also be intentional down-cycling of infrastructure, before it is discarded. Phishing, in other words, may be the last stop before domains and servers that are losing value are finally given up. The Tibetan community has been targeted by sophisticated, persistent attackers for over a decade. Scarlet Mimic is just one of these attack groups, and over the years they have demonstrated deep familiarity and inside knowledge of the Tibetan groups they target. They have also shown themselves to be adaptable and responsive to changes in the security behaviors of their targets. Their most recent turn to phishing seems to reflect this adaptability (although we leave open the possibility that malware attacks are continuing, using other infrastructure). A number of factors may have played a role in this transition, including an increase in certain security behaviors within the Tibetan community (such as not opening or sending attachments), and increasing rates of detection by antivirus products. The information targeted by this group is sensitive, and in the hands of a well-resourced adversary, such as the sponsor of Scarlet Mimic, could cause harm to the safety and security of individuals in Tibet. The extracted information could also be used in support of efforts to frustrate and isolate political groups in the Tibetan diaspora. Phishing relies on tricking users into entering credentials. In this case, there are several telltale signs (such as a slightly outdated Gmail login phishing page) that may suggest to potential victims that something is “not quite right.” However, there are also a number of tools and tactics available to users in the Tibetan community and beyond to stay safe online We describe several of these below. What Can Targeted Users Do? Use two-factor authentication. This feature is available on many popular email and social network services including those from Google, Facebook, Microsoft, Yahoo, and others. Enabling two-factor authentication means you have to enter your password as well as a code provided by a text, app, or security key to access your account. The second factor helps protect you from credential theft. Password Alert [get it by clicking here] is a Chrome extension developed by Google that notifies you if you enter your Google credentials into any pages other than the real Google login page (https://accounts.google.com). Always be cautious about emails containing links or attachments and carefully examine the email sender address in suspicious messages. If an email contains a link always verify that the domain in the URL matches the link text. For further resources on digital security see Tibet Action Institute’s Be a Cyber Super Hero project. 1.The one divergence from this pattern that has been previously reported was a 2013 Strategic Web Compromise (SWC) attack against the Tibetan Alliance of Chicago’s website documented by WebSense. A SWC is an attack in which attackers compromise normally trusted websites and serve malicious code to specific visitors. In this case, the attackers used the Tibetan website to serve an Internet Explorer vulnerability (CVE-2012-4969) that was patched in 2012. This attack used the domain mail[.]firewall-gateway[. ]com as a C2, which is from the same dynamic DNS service as the FakeM SSL Custom variant attacks. This research was supported by the John D. and Catherine T. MacArthur Foundation (Professor Ronald J. Deibert, Principal Investigator). Special thanks to PassiveTotal, Ron Deibert, Lobsang Gyatso, Sarah McKune, Adam Senft, and Nart Villeneuve. The first phishing attack we saw was sent on November 9, 2015 to a group of Tibetan journalists. The message purported to contain a link to a document with information on a controversial Buddhist sect known as Dorje Shugden or Dolgyal, which has been involved in protests against the Dalai Lama. The link “Who is demonstrating against the Dalai Lama.doc” actually goes to http://accountgoogle[.]firewall-gateway[.]com/servicclogin. When we first checked this link on November 13, the page was down and we therefore do not know what the original destination content was for this attack. On November 25 the link was active and the destination content was a public Google Drive folder that contained campaign materials on climate change from a Tibetan NGO. 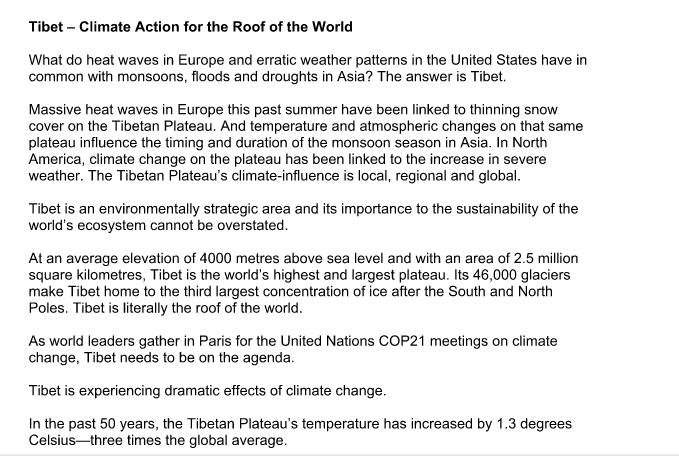 The climate change theme is significant, as during this period Tibetan organizations were taking part in advocacy to raise awareness on climate change in Tibetan areas in anticipation of the United Nations Conference on Climate Change held in Paris, France from November 30 to December 12, 2015. The second phishing attack was sent to Tibetan journalists on November 22, 2015. 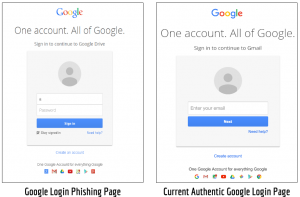 On November 22, 2015, if users entered their credentials into the Google login phishing page they would be redirected to the video described in the email. 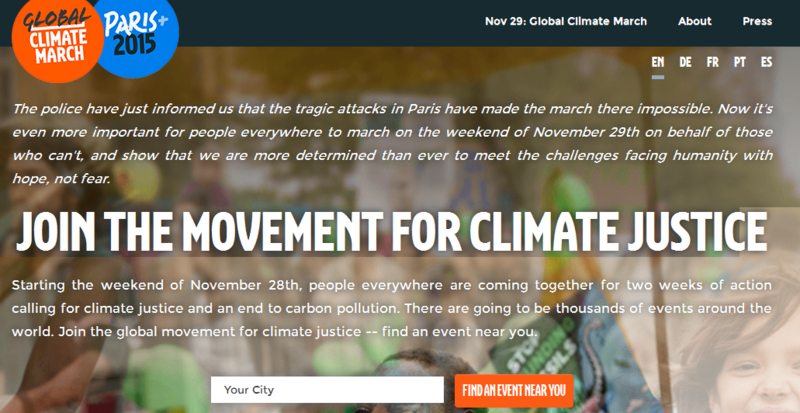 On November 25, 2015, the destination content was changed to a website used to organize the Global Climate March (globalclimatemarch.org), a demonstration to raise climate change awareness around the United Nations Conference on Climate Change. The November 25, 2015 destination content change shares the timing and theme of the change we observed on the previous URL path variation. While we do not have additional phishing emails from this period, these commonalities suggest the attackers were sending phishing emails with climate change themes around November 25, 2015. On November 23, 2015, an email appearing to be from the Press Officer of the Central Tibetan Administration was sent to multiple Tibetan journalists, activists, and NGO staff members. 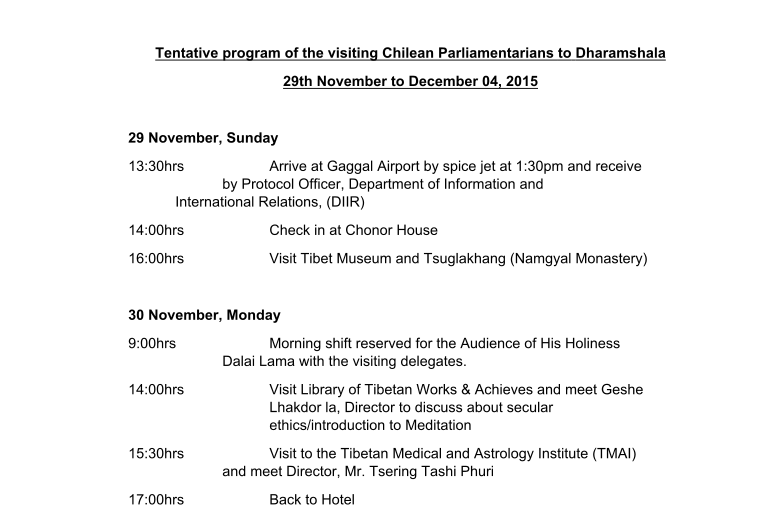 and Tibetan final elections at Lhakpa Tsering hall, DIIR, on November 27, 2015, at 10:00 AM. The “Press Invitation.pdf” link actually goes to http://filegoogle[.]firewall-gateway[.]com/servicelogin. On November 23, when the email was sent, if the user entered their credentials into the phishing page they would be redirected to a Google Doc containing a copy of an op-ed written by the Central Tibetan Administration on climate change. The destination content and the email message do not match in this case, which may be evidence of the attackers neglecting to switch out content from a previous campaign. On November 26, 2015, the destination content to which the phishing page redirected users was changed to a Google Drive document that provides the program for a visit to Dharamsala, India by Chilean Parliamentarians.